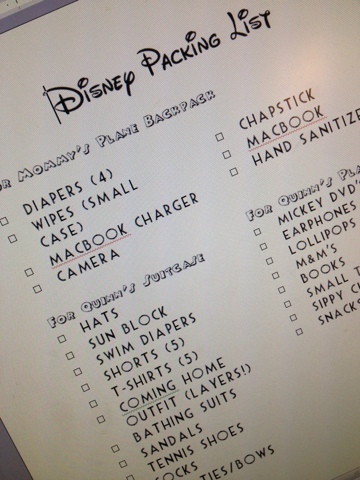 We are only a few short weeks away from our big Disney trip and I am starting to get a little stressed out! To be honest, I am beyond excited. The only thing that scares me just a little bit is the flight. Which by the way is only 2 hours long, but still. I started making a list, because I am a control freak who needs to have everything written down (and obviously Disney font-ed). The house we are renting is good to go, the plane tickets are good to go, park tickets have been purchased, now we just have to rent a car and that should be it! Super excited for you!! I can't wait to take my son soon! We nominated you for the Liebster Award :) Hope to send you a few more followers! I can't wait to hear about your trip! If you blog it, please email me so I make sure not to miss it - we're going in a few months and I want to see how it goes for you!